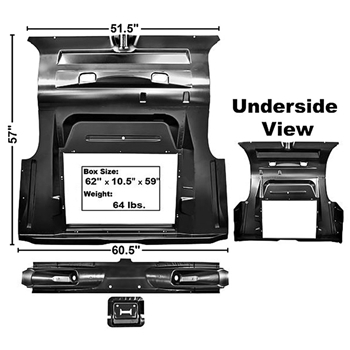 Fits 1964–65 Falcon 2- and 4-door sedan, hardtop and convertible. Complete trunk floor that includes the center floor panel, rear filler panel, left-hand and right-hand floor pans with extensions, and the rear cross-member. This is an excellent reproduction and is easier to install than multiple floor pan repair panels. Gives a more factory-original appearance and makes a more rigid floor. 18 gauge (0.0043") stamped steel. NOTE: There is a $10.00 per order boxing fee for this item. NOTE: This item ships via truck freight. Please email us for details and estimated shipping cost.